In “Trisomy XXI” by G.A. Minton, Joshua Allen enters into this cruel world with Trisomy XXI, an extra chromosome resulting in Down syndrome. His mother died during childbirth, leaving him to be raised by an unforgiving, alcoholic father who blames Joshua for her death. Convinced that his son has the devil in him, his father raises him with hatred and abuse. Joshua celebrates his sixteenth birthday by going for a bike ride with his best friend and champion from childhood. After a preventable tragic accident, Joshua’s whole world begins to change. After being mysteriously slipped a healing dose of medicine into his IV, Joshua regains consciousness and discovers that he has been cured of Down syndrome. Not only is his DNA corrected, but Joshua also loses the common characteristics of this syndrome, and becomes extremely intelligent. This further convinces his father that the work of the devil is involved. Joshua’s miraculous recovery allows him to become close with his doctor and the man’s beautiful daughter who happens to be in the same grade as Joshua. After they start hanging out, certain people who are after Joshua meet with some untimely but deserving circumstances. Joshua has no idea what is going on, but a cantankerous old timer believes that aliens are involved. Joshua soon learns that his blood could save an entire race of aliens who are under attack by an evil alien who is out to try to prevent Joshua from being their salvation. Joshua and his friend’s race against time find unique ways to try to kill off the evil alien and save an entire race. 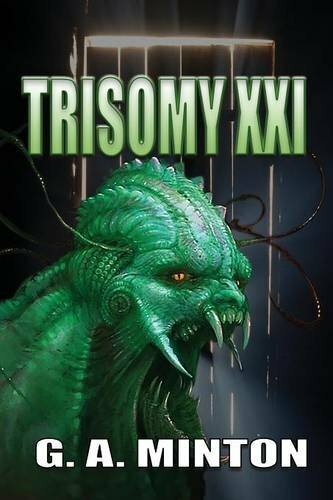 "Trisomy XXI" is a fun, exciting science fiction adventure. Yes, it has its gruesome, gory scenes, but since we all know that they are fiction, it is okay to enjoy them! The writing is spectacular, and author G.A. Minton has a great talent for describing his scenes and characters in vividly colorful detail. Some of the characters, especially the cantankerous old man, will have readers laughing out loud. Minton’s ability to drive the story across the genres makes for decidedly entertaining reading. I highly recommend this book to teens and adults who are fans of adventurous science fiction!